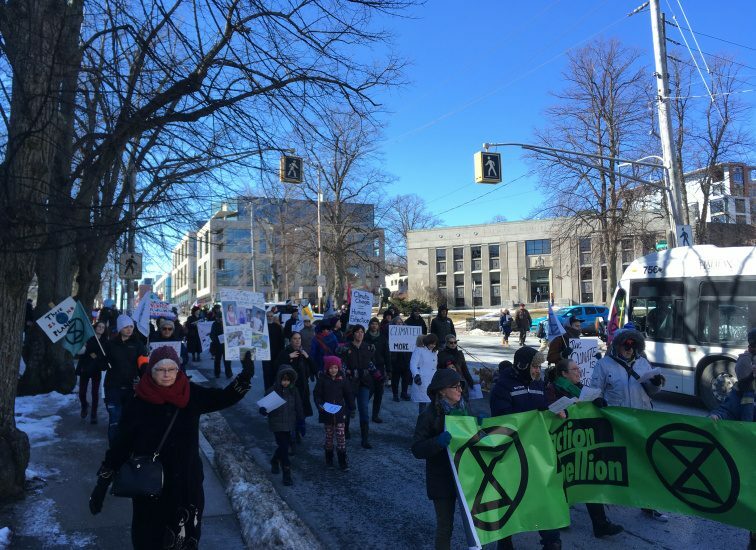 On the afternoon of Sunday, February 17th, some one hundred and fifty adherents to international climate crisis movement Extinction Rebellion blocked traffic at several major intersections in downtown Halifax. 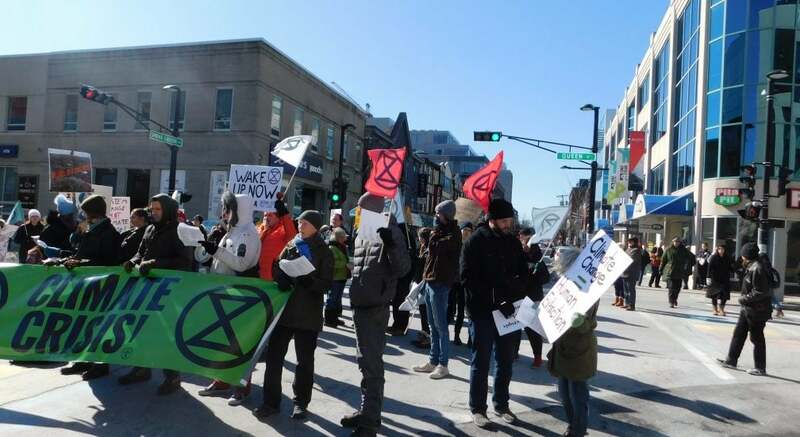 Bearing large banners proclaiming “Climate Crisis” and “Extinction Rebellion”, the crowd waved multi-coloured flags with the group’s iconic empty hourglass symbol, chanted and sang classic songs like Louis Armstrong’s ‘What a Wonderful World’ and Joni Mitchell’s ‘Yellow Taxi Cab’. The group had alerted Halifax Regional Police to their intentions in advance. The police responded by blocking off broader swaths of the downtown, for safety purposes. “After a while of holding the intersection, we realized the police were not interested in removing us,” one participant noted. “They had blocked cars off so far away in each direction, we decided we needed to march on another major road in order to maintain visibility.” The group marched down Spring Garden road and up Barrington, blocking traffic and prompting police to stay ahead and block even more sections of the downtown. The group marched all the way to City Hall, celebrating with chants of “this is what democracy looks like” before returning to Barrington to block it again. The group later travelled back up Spring Garden to block the intersection at South Park. Before taking to the street, the group performed a “Species Die-In”. As they called out the names of different extinct and endangered animals, they rang a bell ominously to cue someone to fall to the ground and “die”. When they got to the final species, they read out “humans, due to drought – humans, due to flooding – humans, due to food shortages…”. The crowd banged drums and chanted as each person fell. The action comes as part of a National Week of Rebellion, which saw similar actions in other provinces. The group demands that all governments acknowledge the climate crisis, enact an immediate drawdown to net-zero greenhouse emissions by 2025, and allow citizen oversight over the process. 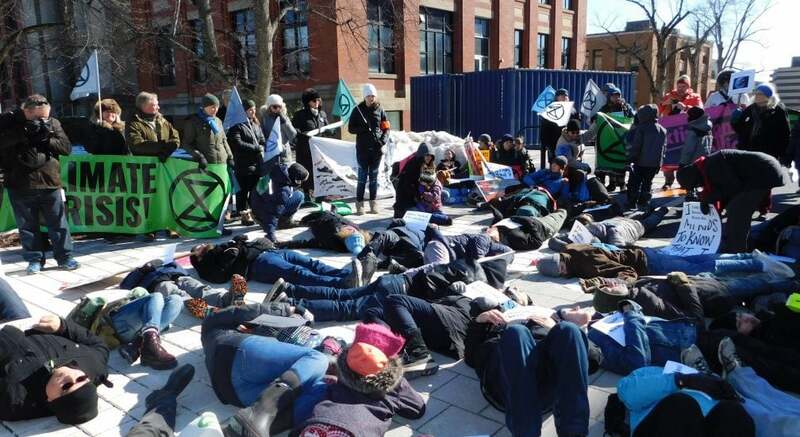 The Nova Scotia group hopes to build on the success of their first action, and plans to organize more talks around the province in the run-up to an International Week of Rebellion in mid-April. Heartening. Necessary. Let’s hope this thing snowballs faster than fossil-fueled greed & complaceny can handle!